It is very easy in Christendom today to major on the minor as people say or neglect the things that really count. Some believers don’t feel they are really serving God or doing anything important simply because their names are not seen on billboards or neon lights. They feel God is not pleased with them because they have not recorded miracles like raising the dead and opening blind eyes. They struggle to play in the major leagues of Christian ministry where they can found a church or fellowship with thousands of members or acquire relevance by some other contemporary standards. We should spend quality time with God, appreciate Him and listen to His counsel. There are things that burden and excite God and He wants those that can be intimate with Him to share them with. “Behold, I give unto you power to tread on serpents and scorpions, and over all the power of the enemy: and nothing shall by any means hurt you. Notwithstanding in this rejoice not, that the spirits are subject unto you; but rather rejoice, because your names are written in heaven” (Luke 10:19-20). Also, do not neglect to share the gospel and care for people around you. God values you, He is taking note of your faithfulness, He rejoices over the fruit you are bearing, be it little or much, because it is fruit that will abide unto eternal life. If you do the foregoing, when the anointing for signs and wonders comes, it will be authentic and it will not derail you in your walk with God. You will not be deluded by fame, wealth or influence. Rather, you will do only that which God has called you to do, not what others are doing, what will make you popular or what is lucrative. You will remain under the authority of your Father and return all the glory to Him. “Come, ye blessed of my Father, inherit the kingdom prepared for you from the foundation of the world: For I was an hungred, and ye gave me meat: I was thirsty, and ye gave me drink: I was a stranger, and ye took me in: Naked, and ye clothed me: I was sick, and ye visited me: I was in prison, and ye came unto me” (Matthew 25:34-36). And while you will be wondering when you did all that to Him, He will say, “Inasmuch as ye have done it unto one of the least of these my brethren, ye have done it unto me” (Matthew 25:40). With the love of Christ in my heart for you, dear believer, I pray that you stay blessed and rapturable. Thank you Aunty Edith, for sharing this revelation.. God will continue to bless you..
Amen. You're blessed too, Immense. Yes, very timely and well worth the read, Ugochi! Keep it up! Thanks, Chinwe! I crave your prayers for constant grace. My love to all yours. I like the way you encourage us to share the gospel with people around us. God puts those in our path that we can inspire and He knows what He's doing so we must comply and not shrink back with the opportunities. I like the encouragement you share also to keep alert in our every ordinary days! Thank you for visiting me. Thanks for returning the love, my dear! I'm glad you we're blessed by the post. Who said that were we are is not enough? That is only right when you are stagnant. Every little role done diligently is important. Thanks Ma for reminding us to be content with the little we are. Praise God! Unfair comparison and unhealthy competition are unhelpful to a child of God. Bless you, Ifechukwude! So true, my dear! God notes the minutest details of our lives. Nothing is hidden from Him and He does not owe anyone. Reward He will as surely as the day turns to night. Stay blessed in Jesus' name. Thank you Ma for this. I am blessed by this post. Amen. Abiding in true service to one another till Jesus comes. Little things eventually develop into greater situations we can't handle. 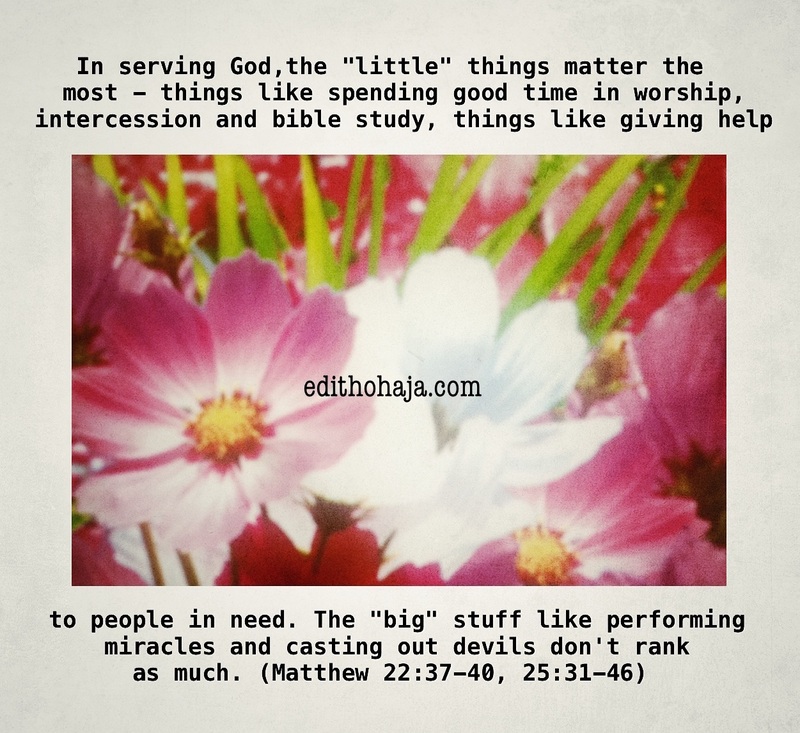 We as Christians, must always be careful on how we neglect things as we call them little. Sweetheart, did you read the post? Check it out. I believe it will bless you. i thank you lord for the little things in my life. the things i consider unimportant but are priceless. thank you for the free gifts which i can not pay for. i pray you open my eyes to consider the magnitude of the so called little things and to always be appreciative of all that you do. it is really important to show love to God for the various little things which we barely remember. to you lord be all the praise forever, amen. Sometimes, the smallest things we neglect in our daily lives do make the most significant impact on the lives of those around us. Because we are not ministers doesn't mean we can not preach the gospel with our smiles, encouragement, alms giving, prayer and visitation to the sick and prisoners. Every gift we have been given by God should be used for the propagation of the kingdom and not for our personal aggrandizement. Everyone of us have been blessed by God in different ways and it should be properly utilized. Thank you ma for this write up , doing the work of the Lord is a reward we get in heaven so there is no need of someone to go to church and be doing notice me maybe you dropped 5k for offering and you want everyone on your roll to notice you ,it's wrong in the eyes of God ,thank you ma'am also for letting us know about the spirit of been contented with what we have because that also can play a very demonic role in ones life. Thanks a lot for pointing this issue out!! We can do a lot to serve God even if we don't perform "miracles". Some of us think that we must be ministering from place to place or raising the dead before we can be called the sons of God. In the process of seeking these powers, we may fall into temptation or begin to feel too big when we attain these powers. As Christians, the most important thing is working in the light of God, meditating on his word, believing in him, ministering at whatever level we can and so on.